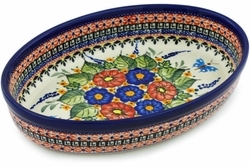 Dress your table with this Polish pottery Oval Baking Dish. This beautiful baker goes easily from oven to table. Handcrafted of high-quality stoneware that’s durable enough for everyday use. Painted and glazed by hand. For best results avoid sharp temperature swings: cold to hot or vice versa. Order this addition to your polish pottery dinnerware set today - it will quickly become a family favorite. Size: 11 1/4" x 7 1/2" x 2 1/4"